HOW WE PREDICTED THE FUTURE- BY MAKING FUN OF THE PRESENT. Hypergrid Adventurers Club Tour of Cube3/CubicSpace Open Sims at Reaction Grid. Heres a link to the transcript and a bunch of screenshots from the tour taken last week. Thanks to all who joined us, and to John Lester who put the who thing together. His group gets together weekly to tour the hypergrid and virtual places on the net. Check out his sites schedule for other tours! 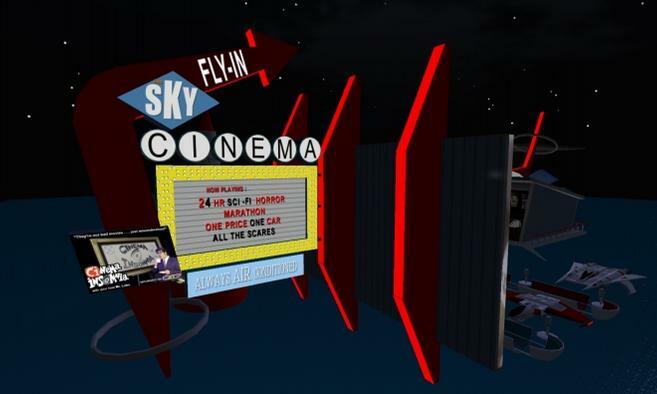 Watch retro sci-fi, horror and B-movies at the Sky Cinema Fly-in Theater. Many of the games and projects shown will appear very much like many of the web3d or machinima projects youll see today- a decade later. and many of the core technologies are similar. Sadly this site launched in September of 2001. Surfice it to say, I as well as Showtime, in NYC- didnt feel the ability to “ra ra cheer” and promote very much for the next few months. 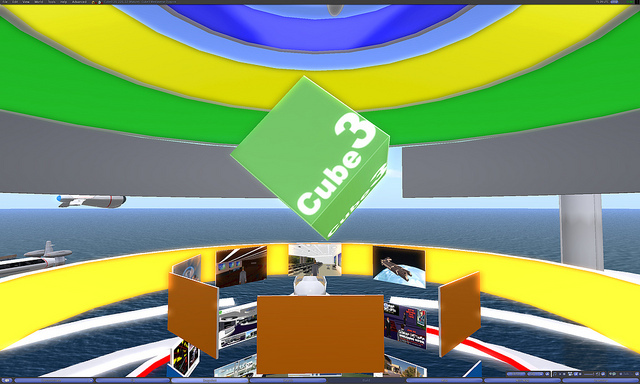 The site and the works shown now only make up the past of web3d. A past that has some of its main text archived, but not the actual “art” or “experiences” created. They no longer are for the most part accessable since the creators/owners of the technologies no longer enable it. 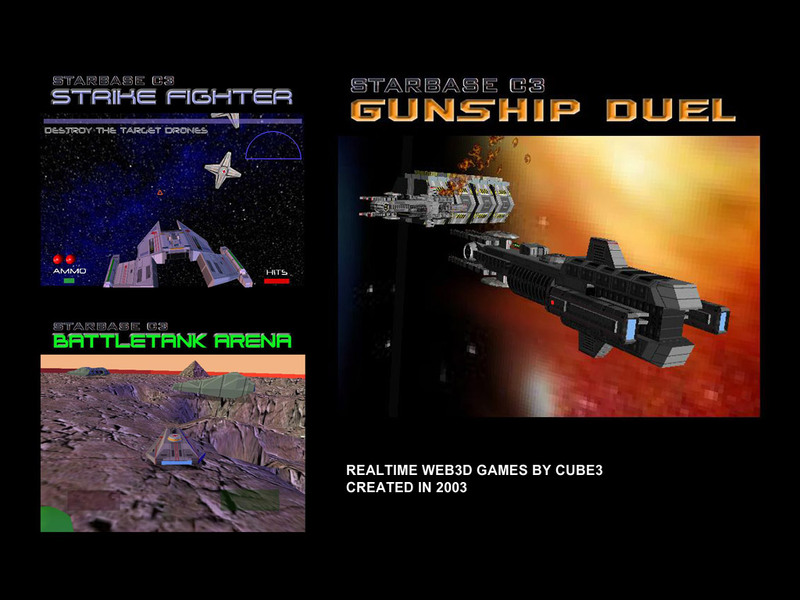 Ive uploaded an image of three web3d games that were done in 2003 for our Starbase C3 SCI FI Website Community. They were built using an application called Axel3D which was very much like Unity3D which has become very popular today. If the folks behind Axel3D had held on a little longer, and had a bit better timing, they too might be part of the re-emerging web3d games/facebook/ social game boom. These games can no longer be played since the plugin is no longer distributed, but here are a few screen shots of the games. They were simple one player shooter games that today could be multiuser using the new technologies for web3d games like Unity3D. If interested in them, please let me know. Im reading more and more posts from Second Life refugees and survivors that are predicting and lamenting the fate of their “virtual world” reality. One common online discussion is all about the addition of “meshes” to import into SL and the “idea” that this will “destroy” the “society of virtual worlds like SL” Theres a strong “we need easy inworld tools” contingent who believe that ‘everyone HAS to be a creator of stuff” to have a “world”. 1. SecondLife was never a world..or a “good” model for a sustainable society that could compare to democracy as a way to run “a world” . It had elements that “looked” democratic like the easy tools to make a prim, but other parts of the business system canceled out any “freedom” or “rights” that any user truly had. Most of this is now apparent to finally a majority of the SL users after 5 years. 2. If any “virtual media” lessons can be learned in a larger than just Linden Lab way, Its that SL created a mirror simulation of the “desktop publishing” era of creative “freedom” for users of its systems/tools. Amature and Experts of a past media became leveled and alot of “stuff” was generated. But like all cycles that will soon become dominated by ROI, a professional class will emerge based on skill and relationships. SL as a walled platform has always worked this way, and the addition of other tools to its content creation pipeline has alsways been its methods of tehc growth, no matter what internally happens within the experiment- the SL grids and its customer base. In any case, no matter where a person is in this “game” either to benefit or not from the latest LL plans, one can be happy the results are trapped within the walled sytem of SL. 3. Whats most uncomfortable is the “ideas” that keep being broadcast by those “making the bank” via the SL /LL systems that these “ways” to govern and interact within society are needed in the outside -aka realworld. and our government systems. Worse they see “virtuality” and “virtual worlds” AS mechanisms to govern. Maybe they should wait until the “experiment” is over before they write their grad papers or want to be realife leaders of the larger society beyond the coders they employ.